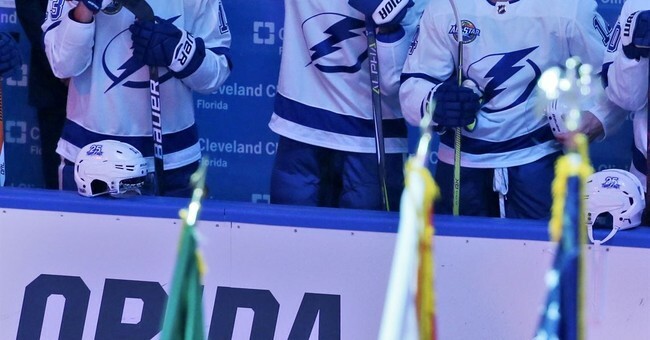 Protests of the national anthem aren’t just happening in the NFL— Tampa Bay Lightning forward J.T. Brown raised his fist in the air during The Star Spangled Banner earlier this month, and also before a pre-season game in September against the Panthers. Brown was of course following in Colin Kaepernick’s footsteps, protesting police brutality and racial injustice in America. The move caught the attention of Tampa interim police Chief Brian Dugan, who invited Brown to the academy last week. To his surprise, Brown took him up on the offer only a few days later. J.T. Brown spent Friday afternoon getting shot at during a traffic stop. The bullets were blanks, of course, with the Lightning wing role-playing as a police officer in the Tampa Police Department's Citizens Police Academy. The red sedan that Brown and Lightning teammate Gabriel Dumont pulled over was missing a tag. They weren't expecting an ambush. "You realize every time you leave the (police) car, it could be the last time," Dumont said. Brown, Dumont and Vladislav Namestnikov were taken through the academy, offered a few times a year to citizens. They went through mock traffic stops, and attended to reports of domestic violence and drunk and disorderly at a bar. They participated in computer simulations that teach when there should be shoot and no-shoot scenarios. Brown, an active video gamer, said it wasn't always easy to tell what was an active threat. Dugan said he wanted the men to experience the decision making process police officers must make every day on the job. “I think it was a good first step to build the dialogue and get people talking about the issues out there,” Dugan said, reports WFLA.com. Brown tweeted out a video of one of the simulations, saying he "wasn't ready for this traffic stop." He also said he had a "great" time with the officers and thanked them for the invitation.